Government of Haiti has launched a vaccination campaign against cholera that aims to reach 400,000 people in 2016. Deputy Secretary-General Jan Eliasson said today that the first track of the new United Nations approach to tackling cholera involves intensifying efforts to treat and eliminate the disease and boost access to clean water and sanitation; and the second track aims to develop a framework proposal to Member States for material assistance to those Haitians most affected by cholera after the 2010 outbreak. Mr. Eliasson briefed Member States alongside Dr. David Nabarro, Special Adviser to the Secretary-General on the 2030 Agenda and Ross Mountain, Special Adviser on the Impact of Cholera. The Special Representative of the Secretary-General and Head of the UN Stabilization Mission in Haiti (MINUSTAH) and Deputy Special Representative Mourad Wahba joined in via videoconference from the capital, Port-au-Prince. The deputy UN chief said that today, there could be no discussion of cholera situation in Haiti without taking into account the devastating impact of Hurricane Matthew, which had left millions of Haitians on the southern coast of the island in “dire and desperate need of humanitarian assistance.” Mr. Eliasson praised the Government of Haiti’s leadership for their action thus far and hailed the “strength, resilience, and resourcefulness of the Haitian people,” while simultaneously emphasizing the need for support from Member States. He went on to reaffirm the compassion and solidarity of the United Nations and its Member States with the people of Haiti, and he reassured the nation that the UN would act with the greatest possible speed to bring assistance. “We must convey to them that our approach to the hurricane and to cholera includes a commitment to help forge long-term solutions. We must deal with the underlying problems of poverty and fragility that make each successive shock so much more damaging,” he said. Mr. Eliasson said that UN Secretary-General Ban Ki-moon travels to Haiti tomorrow in order to deliver that same message of solidarity to the country. So far, the Flash Appeal launched Monday by the UN Office for the Coordination of Humanitarian Affairs (OCHA) has requested nearly $120 million in order to provide food, shelter, water and emergency sanitation over the next three months for the 750,000 people most impacted by the hurricane. Many of these people are in hard-to-reach areas.Meanwhile, water and sanitation infrastructures have been destroyed, prompting a need for quick and early action – especially to prevent the spread of cholera. So far, the UN Children’s Fund (UNICEF) has scaled up with a recent Central Emergency Response Fund (CERF) loan, and World Health Organization (WHO) has sent one million vaccinations against cholera for immediate use. First, efforts must be intensified in order to treat and eliminate cholera and to improve long-term access to clean water and sanitation. “We must build resilience to the disease,” the Deputy Secretary-General said. Second is a framework proposal to Member States in order to acquire material assistance to those in Haiti most affected by the 2010 cholera outbreak. The Deputy Secretary-General announced that the Secretary-General would present a proposal to the General Assembly before he leaves office. That proposal will be discussed with both the Haitian Government and citizens affected by cholera. How do we identify and prioritize potential beneficiaries on the basis of partly incomplete information? How and when are we to conduct the consultations in Haiti? How are we to balance the potential mix between individual/household and community/collective benefits? How do we implement the arrangements for the package? He underscored the need for material commitment from Member States in order to effectively design a package, particularly in light of the increased demand for assistance following the hurricane. The UN anticipates that total funding for the two tracks outlined above will amount to $400 million over the next two years. 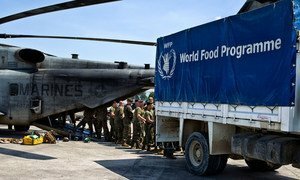 United Nations relief agencies are continuing work on the ground to assist Haiti in the aftermath of powerful Hurricane Matthew with the World Food Program (WFP) today helping to provide supplies for some 750,000 people, while the UN health agency and its regional partner have appealed to donors for $9 million for emergency health operations.